Chris Ogden stopped by the UNM Clinical and Translational Science Center’s Pulmonary Lab recently to donate his breath to biomedical science. Born in Las Cruces, the UNM music education and saxophone student has been a patient at UNM Hospital for as long as he can remember, making regular trips to Albuquerque since being diagnosed with cystic fibrosis when he was a year old. 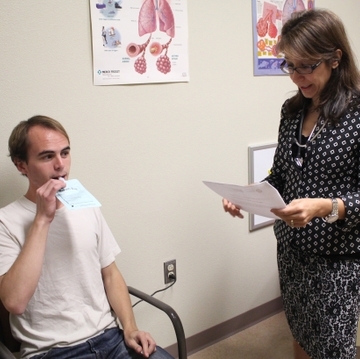 The UNM Cystic Fibrosis Center is the only one of its kind in the state. 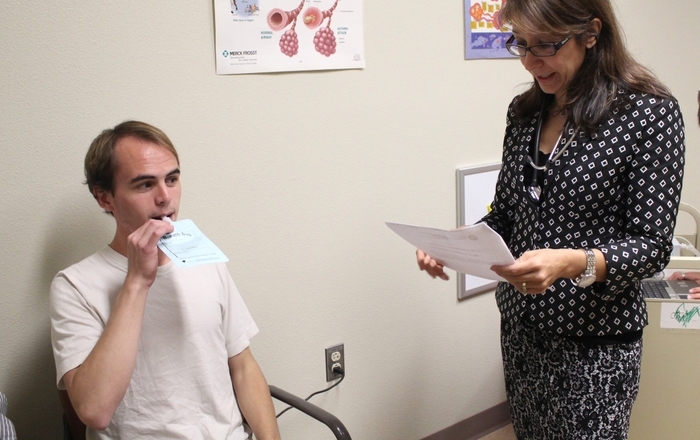 Now Ogden is participating in a clinical trial at UNM, where he hopes to help researchers develop future treatments for other cystic fibrosis patients. 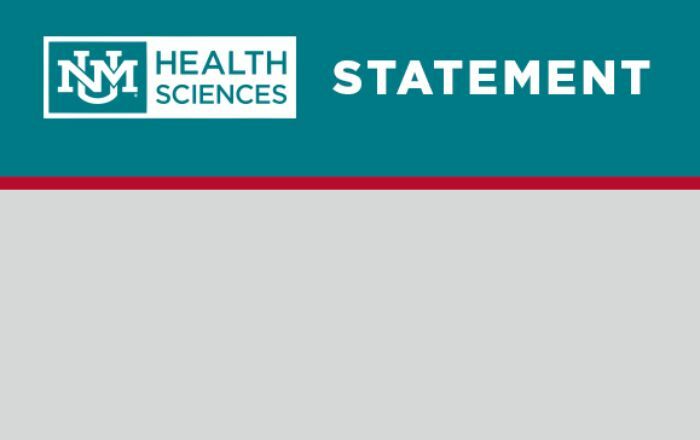 The study is being led by UNM pediatric pulmonary specialist Hengameh Raissy, PharmD, an associate professor of pediatrics and associate director of the UNM Clinical and Translational Science Center (CTSC). Raissy is creating a diagnostic tool with the potential to dramatically improve the care of CF patients by providing a non-invasive way to detect Pseudomonas aeruginosa in the lungs. Pseudomonas is a common bacteria that can cause dangerous infections in the lungs of people with cystic fibrosis, a disease that causes the lining of lungs, pancreas and other organs to produce abnormally sticky mucus. This mucus obstructs airways and glands, making affected organs much more prone to infections, like those caused by Pseudomonas. Approximately 35 percent of children with cystic fibrosis already have Pseudomonas in their lungs. Pseudomonas infections are diagnosed and monitored by culturing cells taken from a patient’s coughed-up mucus or collected using a throat swab. But waiting for cells to culture outside of the body is time consuming, and sometimes the results are inconclusive or misleading. So antibiotic medication is generally given on a predetermined schedule to prevent exacerbations, rapid and potentially life-threatening increases in the bacterial load. Doctors have no way of knowing exactly when the medication is needed. Once patients display symptoms of infection, it is often too late to prevent an exacerbation. Raissy and her colleagues hope that the diagnostic tool they're working on will give clinicians an accurate and non-invasive way to monitor bacteria so they can adjust medication levels as needed to prevent exacerbations. Research coordinator Christina Batson is part of a team working to develop new cystic fibrosis diagnostic tools. "This technology presents the possibility of providing antibiotics rationally to see if they are working and know when it is time to stop to adjust the dose,” said Graham Timmins, PhD, an associate professor in the UNM College of Pharmacy who is working with Raissy on the project. Raissy and Timmins are using nebulized urea to dynamically monitor bacteria via a simple breath test, one that could be conducted non-invasively and rapidly in the clinic. Here’s how it works: A nebulizer machine creates a fine mist of urea, a common and non-toxic waste product that results when cells break down proteins. When the patient inhales the chalky-tasting mist, the urea interacts with Pseudomonas, releasing a unique type of carbon dioxide. After a few minutes, the patient breathes into a little bag to collect the exhaled air, which can then easily be analyzed for carbon dioxide. The researchers hypothesize that due to the chemical metabolic reaction between Pseudomonas and urea, the concentration of carbon dioxide will correlate directly to the amount of Pseudomonas in the lungs. Timmins developed the patent for using inhaled urea to diagnose lung infection. 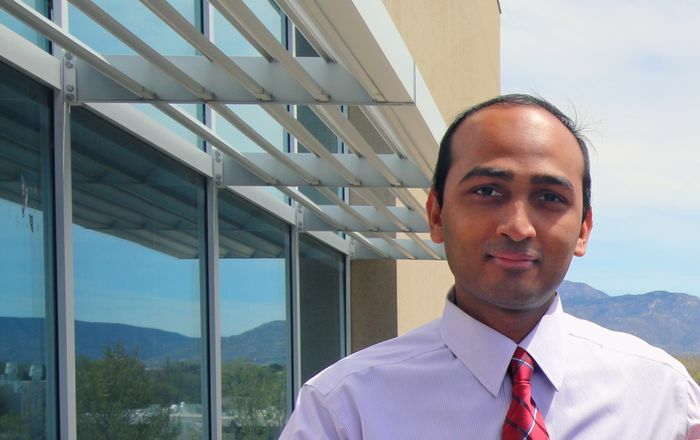 He is interested in developing inhalable compounds for clinical applications, such as using exhaled human breath to find (and create) biomarkers, or indications, of lung disease and infection. Only three breath tests have been approved by the FDA to date. One, which tests for H. pylori bacteria in the gut using a similar urea solution, provided preliminary guidelines for Raissy and Timmins as they developed the test for CF patients. “Bugs on a petri dish live in an isolated environment,” says Timmins, who is also working on a breath test for tuberculosis. “If you want to know what is happening in the host, you need to be able to study the real context – in this case the lungs." When he signed the consent form, Chris Ogden didn’t realize he would be the very first person with cystic fibrosis to test out nebulized urea as a diagnostic tool. Raissy is administering the solution to patients with known Pseudomonas infection to see if it works and to set dosage. First, Ogden was given a common spirometry test to measure lung function. Respiratory therapist Abby Redway provided some coaching on how to “blast” the air out of his lungs as forcefully as possible—not that he needed much help. Ogden’s lungs get a regular workout playing saxophone in the UNM Wind Symphony, so he has excellent lung capacity. Then he breathed into six pastel blue bags to provide baseline samples of exhaled breath. 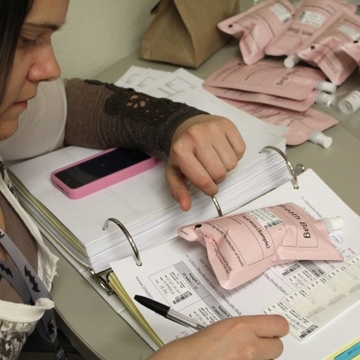 CTSC research coordinator Christina Batson retrieved the urea solution from the UNM Health Sciences Center’s investigational pharmacy and prepared the nebulizer machine, while mucus samples were collected to provide a comparison with the standard diagnostic practice. After taking a dose of albuterol from an inhaler to open up his lungs as much as possible, Ogden inhaled the nebulized urea. He then blew into six more bags (pink this time) at five-minute intervals. The team watched with anticipation as the table filled up with the little color-coded air pillows, which would be sent to a lab for processing. The diagnostic kit they’re developing could be especially useful for treating children, because they cannot produce samples of coughed-up mucus, or sputum. Some CF adult patients with comprised lung capacity are also unable to produce sputum. Clinicians have to rely on throat cultures obtained by swabbing deep into the throat—difficult at best with small children and often very unreliable. “My fairytale is that someday the little kids I work with won’t know what a throat swab is,” said Redway, as Ogden nodded knowingly. Extraordinary advances have already been made in the last 10 years in cystic fibrosis research and management, leading to increased life expectancy and quality of life. Since 2002, the average life expectancy for people with cystic fibrosis has increased from 31 to 41 (in the 1950s, children with the disease were not expected to live long enough to attend grade school). This is partly due to mandatory screening for all newborns, as well as better tools and therapies, such as inhalable antibiotics, that better manage cystic fibrosis symptoms. Raissy hopes that the urea diagnostic kit will continue to improve the outlook for patients. The next step in her study will be to conduct a larger trial in order to correlate results from the breath test with severity of infection. 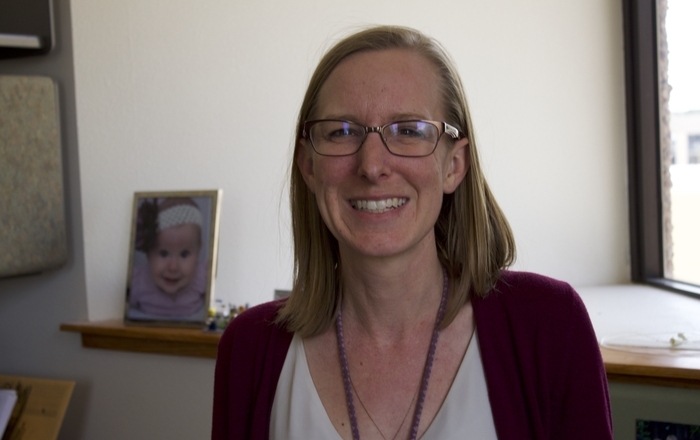 She plans to reach out to other centers in the Cystic Fibrosis Foundation network, as well as other Clinical and Translational Science Award centers to bring the diagnostic into the next phase of development. And while the immediate goal is to better manage Pseudomonas for cystic fibrosis patients, Raissy and Timmins note that many other infectious bacteria have similar metabolic profiles. That means that in the future, their innovative point-of-care diagnostic method may help doctors screen for other serious conditions, such as pneumonia, that are also primarily diagnosed through bacterial culture.